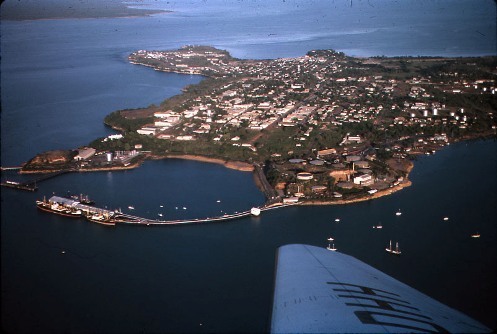 Darwin Harbour was named by Lieutenant John L Stokes in 1839 during the survey ship Beagle's journey along the northern coast. The area has long been home to the Larrakia and Wagait peoples. In 1869 George W Goyder and his team arrived in Darwin Harbour to survey a new town site called Palmerston and this was the beginning of the settlement of the harbour by non-Aboriginal people. Since then the foreshore and surrounds of the harbour have changed significantly. Images and oral histories from the Northern Territory Archives Service (NTAS) have been used here to illustrate some of these changes. View the swimming baths in Darwin Harbour. View the images of ships in Darwin Harbour. You will find information about the photographs held at NTAS in the Images in the Northern Territory Archives Collections leaflet. Go to the Oral History section of this site for information about the Oral History Unit.